We equip our yards with secure areas to protect our cats from other cats, predators and dangers from the street. This frequently includes installing fence-top barriers which prevent our cats from getting on top of the fence. Cats love to be up high so they can survey their domain. Since we do not allow our cats to get up high enough within the fenced area to see very far, they cannot see the "outside world"at ground level very well, except through the cracks between the fence boards which must be frustrating for them. 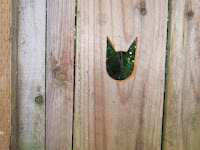 In an effort to help our cats be able to see more of the outside world - with both eyes at the same time - watch other cats, critters and birds at our bird feeders, I created several little windows in the fence at about kitty eye-height. 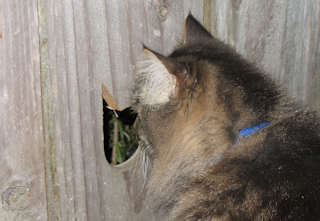 The holes are large enough so the cats can see outside with both eyes, but small enough so they can't actually fit through the hole. To make the peepholes, I drew a template on of a piece of cardboard, cut it out and marked the fence board. I drilled a pilot hole. Then I used a jigsaw to cut out the shape. I created two of these in different places so several cats could use them at the same time. We owned the property and fence, and the holes I created look out into our own "unprotected" yard where our cats never go, so there were no issues with neighbors, etc. 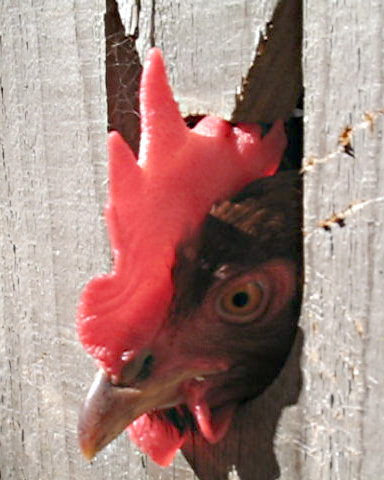 Alternatively, we could have removed the fence board and put one in place with a peephole, then replaced the original later on to "repair" the hole. Our cats loved their new views on the world and used the peepholes all the time. 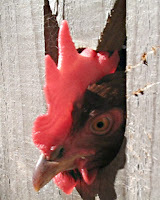 We had a couple chickens for a while and even they used them. Of course, if your cat can come and go from the yard freely, these kitty peepholes do not make much sense, but they sure are cute.